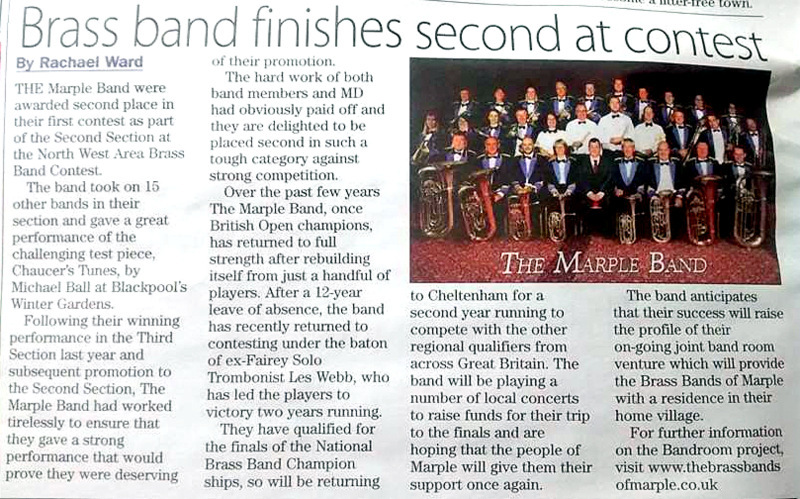 In a historic setting, more famous for the ‘Gold Cup’, The Marple Band triumphed by a clear length to once again bring home the silverware and become the Second Section National Champions. The Ring O’ Bells, Marple – Sunday 27th July – Another outing for The Marple Bierkeller Band – Piste Hägen Brass. A recent article in the Marple Mail. Speaks for itself! By our own Flugel Horn player, Rachael Ward. On Friday May 16th the lady members of The Marple Band heaved-to for a sponsored boat pull to raise much needed funds to send the band to the National Brass Band finals in Cheltenham.